Oct. 26 — Legislation to slow or stop the perceived onslaught of regulation from “unaccountable” federal agencies over the past eight years has consistently failed, but one Republican senator thinks he knows a better solution. 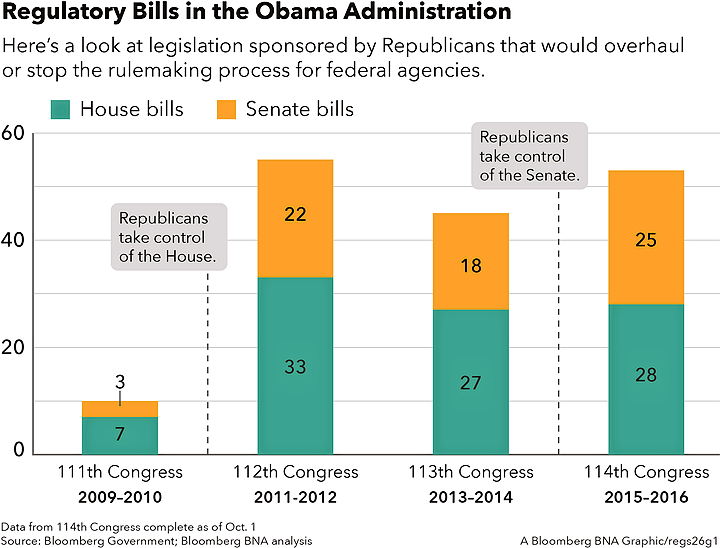 An analysis by Bloomberg BNA of all legislation introduced by Republicans since the 111th Congress that would alter the rulemaking process for federal agencies shows a total of 163 bills, none of which have been presented to President Barack Obama for his signature. In the past four sessions of Congress, the House introduced 95 regulatory bills and the Senate introduced 68. At their most active, Republicans introduced 55 regulatory bills in the 112th Congress, and at their least active, introduced just 10 bills in the 111th Congress. But slowing, stopping or repealing regulations remains an integral part of the Republican policy agenda, both at the presidential and congressional levels. On the campaign trail, Republican presidential nominee Donald Trump frequently calls for overturning federal regulations. Legislation that consistently represents the Republican position on regulatory overhaul is the Regulations from the Executive In Need of Scrutiny (REINS) Act, which has been introduced in each of the past four congressional sessions. The principle of the REINS Act, which is that Congress should approve all major regulations, was included in the 2016 Republican Party platform. Requiring Congress to approve all major rules also is the centerpiece of the regulatory policy agenda proposed by House Speaker Paul Ryan (R-Wis.). Ryan in June unveiled the portion of the GOP’s “A Better Way” agenda that promises substantial action in 2017 to hobble agency rulemaking. But if history is any guide, Ryan’s legislative proposals to overhaul the regulatory process are doomed to fail just like their predecessors. The analysis by Bloomberg BNA shows that not a single regulatory bill was considered on the Senate floor in the past eight years, including the last two years under Republican control. The House has passed a total of 18 bills, including eight so far in the 114th Congress. Even the highly touted REINS Act has yet to be considered in committee in the Senate. And the REINS Act is not the only bill that has been passed in the House session after session, only to die at the Senate’s doorstep. Perennial GOP favorites include the Regulatory Accountability Act, the Searching for and Cutting Regulations that are Unnecessarily Burdensome (SCRUB) Act, and the Sunshine for Regulatory Decrees and Settlements Act. Instead of trying to coalesce 60 votes around a small legislative fix, Lankford called for a judicial response to the issue of Chevron deference, a court decision that he said tipped the balance of power to the executive branch. In 1984, the Supreme Court in Chevron v. Natural Resources Defense Council held that courts should defer to agency interpretations of statutes unless they are unreasonable. “I think that decision has proved to be toxic to the relationship between the three branches of the federal government and the American people,” Lankford said. “The courts messed this up—they’re going to have to help re-establish it,” Lankford said, referring to the correct balance of power among the three branches of government. Lankford, chairman of the Senate Homeland Security and Governmental Affairs Subcommittee on Regulatory Affairs and Federal Management, also has held 12 hearings on regulation over the past two years alongside the subcommittee’s ranking Democrat, Sen. Heidi Heitkamp (N.D.). The politically unlikely pair of senators has delved deeply into the minutiae of the Administrative Procedure Act, which is the statute that dictates agency rulemaking processes. Although both have co-sponsored several bills and ushered a few through committee, Lankford acknowledged in an interview in September that none were likely to pass, in large part because Democrats have no reason to change the status quo. Robert Weissman, president of Public Citizen, a public interest advocacy organization, said he fundamentally disagreed with the premise that there is a “problem” with the rulemaking process that needs to be resolved. Or, the problem is that corporations aren’t held accountable, regulation is incredibly slow to get out the door and the system is massively tilted on behalf of regulated industries, which is not what the Republican bills address, Weissman said. “I think their constant pounding does create on Capitol Hill, a least among some people, a misperception that maybe there actually is a problem,” Weissman said. Republicans often point to thousands of pages in the Federal Register and billions of dollars in regulatory costs that they say kill jobs and slow economic growth as evidence of a problem. But Weissman said an examination of the evidence shows it’s not even a close call. “These are invented and untrue claims,” he said. For example, an analysis of the costs and the benefits of major rules—even calculated by corporate-friendly terms—shows that the costs of regulation are massively outweighed by the benefits, Weissman said. And for the last century, apocalyptic claims by businesses that a certain rule will destroy either the economy or an entire industry just haven’t happened, Weissman said. Benzene regulation was going to shut down the whole petrochemical industry, which didn’t happen, Weissman said. And while the current focus is on coal, changes in the energy markets and the price of natural gas are far more significant than regulation in diminishing the use of coal, he said. Jerry Ellig, senior research fellow at the Mercatus Center at George Mason University, argued that there are two types of problems with the rulemaking process. “These are problems that actually regulatory reformers have been wrestling with for decades trying to find solutions,” Ellig said.One set of problems is that many times, new regulations are poorly thought out and so don’t address a demonstrated problem, or they are broader than they need to be to address the real problem, or they are very costly compared to the problem they’re dealing with, Ellig said. The other problem is, there isn’t a really good, organized process to go back and evaluate seriously whether regulations are accomplishing their intended goals and whether they’re doing so at a reasonable cost, Ellig said. Ellig said that “some bills” in Congress were probably intended to be messages or signals to the regulatory agencies rather than legislative solutions. On the other hand, regulation and the regulatory system are horrendously complicated and members of Congress have constituents who are complaining about the end result, Ellig said. Lawmakers are trying to figure out what levers to push to solve their constituents’ problems, which is not obvious because the system is so complicated, he said. “There is an awful lot of trying out” different ideas to see which ones “might actually work to fix the process,” he said.